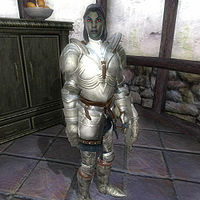 Farwil Indarys is a Dunmer warrior, and the son of Count Andel Indarys of Cheydinhal. 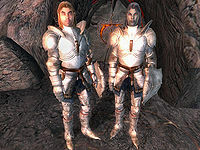 He's the founder of the Knights of the Thorn, and when an Oblivion Gate opens outside the city, he leads his knights into the gate in an attempt to prove themselves. You will have to rescue him during The Wayward Knight quest. He has a flair for the dramatic, and tends to rush right into battle without thinking or planning first. Farwil Indarys wears steel boots, gauntlets, greaves, and a cuirass. He wields the Knights of the Thorn Shield showing his alignment with his order, and a steel longsword. The Indarys Signet Ring he wears reveals his relation to the Count. He also carries the quest reward Knights of the Thorn Medallion. As an NPC ally, he is more of a nuisance than a helping hand. Often he will get in the way of your attacks and you will hit him. Also, he tends to charge into the path of several Daedra, making it more difficult to keep him alive. Be wary- if you hit him by accident, he will not easily accept your yield. However, once the Gate is destroyed he will forget his animosity. After the completion of the quest, Farwil can frequently be found standing outside Riverview, but since the door is locked and he has no key, he can't access the parties being held there. Esta página foi modificada pela última vez à(s) 09h57min de 22 de abril de 2015.